One of the most fascinating aspects of Royal Arch Masonry has always been how so many men, from so many different walks of life, can meet together in peace, never have any political or religious debates, always conduct their affairs in harmony and friendship, and call each other brother. No Rite of Freemasonry covers the world so much as does Royal Arch Masonry. In many countries on the earth and on many isles of the sea, will be found Royal Arch Chapters, eager and willing to receive their companions from other parts of the world into that full fellowship that characterizes Royal Arch Masonry. All Royal Arch Masons believe in one God and in respect for each other. Royal Arch Masonry contains some simple, plain statements of Truth, easily understandable and helpful in our relation to life. Lodge symbolism deals with lessons of the material side of life. 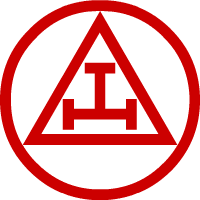 The Chapter degrees, and particularly the Royal Arch, deal with the spiritual side of life. Upon your exaltation as a Royal Arch Mason you will become a member of the oldest and largest rite of Freemasonry. Royal Arch Masonry is the logical step for every Master Mason to take. If after becoming a Royal Arch Mason, you desire to continue your studies, you may take the Council Degrees and the Commandery Orders, both of which are illustrative of and carry forward the principles of the Royal Arch. Any Royal Arch Macon will eagerly propose your name as a candidate for the advancement in the mysteries of Freemasonry. Anyone seeking Membership in the Royal Arch must sign a Petition, stating his age, occupation and place of residence. Members of the Chapter vote by ballot. To be accepted, the ballot must be unanimous. "Pure Ancient Freemasonry consists of but three degrees, that of Entered Apprentice, Fellowcraft, and Master Mason, including the Supreme Order of the Holy Royal Arch."